This guide will show you how to create an ISO image file and how to extract ISO image files from CD/DVD to copy and backup onto computer or other storage mediums. 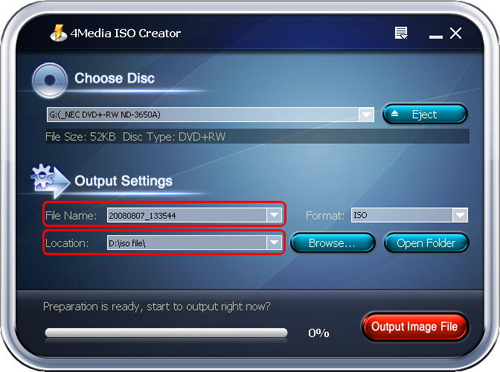 Please refer the below steps to learn how to convert DVD/CD to ISO and help you accomplish the whole task. 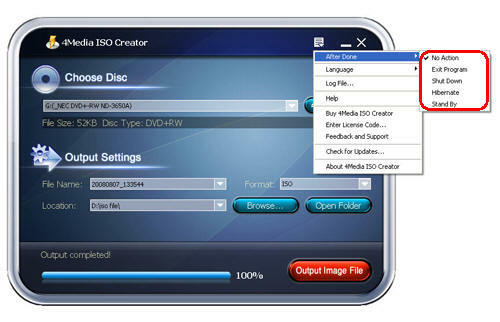 Run 4Media ISO Creator and insert a usable CD/DVD disc. Tip: After inserting a CD/DVD, you can select proper drive which holds the disc. Then the information of disc size & type will be displayed in main interface. 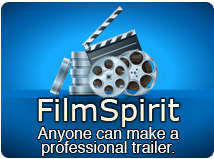 Set the target file name and location from the "File Name" and "Location" drop-down list. Click "Output Image File" to start the converting process. And the software will remind you of successful output when converting is finished. Tip: After the converting process is finished, you can click "Open Folder" to find the output ISO file in the destination folder. Now, the ISO file you need is made successfully and the below features will bring a great help to meet various user needs. 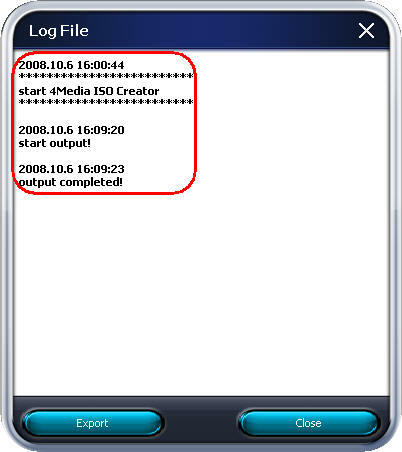 Choose "Log File" from the main menu and the detailed info of the converting process can be displayed for you to view. The ISO creator software provides multiple after done actions like hibernate, stand by, shut down, exit program, etc. for you to choose before making ISO file. English, German, Japanese and Chinese interface languages are offered for satisfying different mother tongue users.